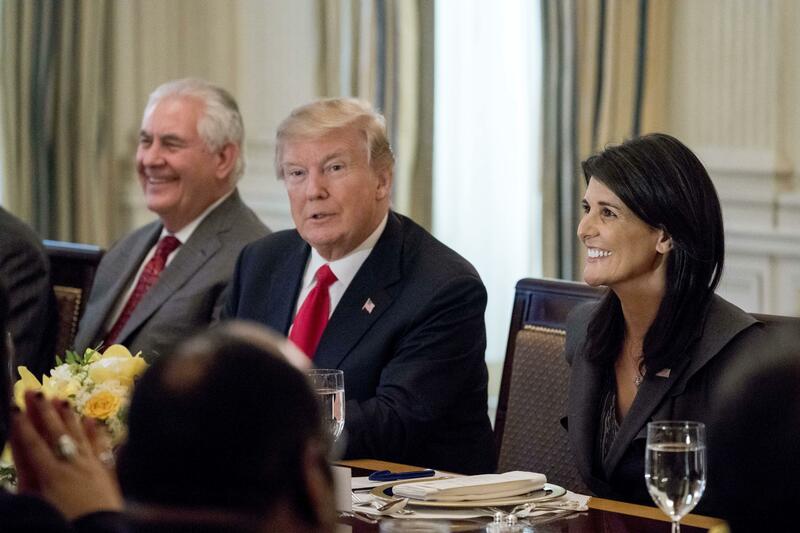 WASHINGTON – President Donald Trump told visiting members of the U.N. Security Council on Monday the U.S. would no longer talk with the Taliban following a recent string of deadly attacks in Afghanistan. Trump railed against a series of “atrocities” in Afghanistan and said as a result the U.S. would not engage in any future talks with the Taliban as the administration seeks to end a stalemate in America’s longest war. The president’s comments followed a deadly car bombing attack in Kabul, the Afghan capital, that killed at least 95 people and wounded 158 more. Earlier this month, Americans were killed and injured in the Taliban’s 13-hour siege of a hotel in Kabul. Trump’s remarks at the diplomatic luncheon marked a shift in tone on Afghanistan. The U.S. has said previously that any peace talks with the Taliban need to be part of an Afghan-led process, but the U.S. has never precluded talking to the Taliban. Trump has sought to change the course of the long-running conflict, sending thousands more U.S. troops to Afghanistan and moving away from a “time-based” approach to one that more explicitly links U.S. assistance to concrete results from the Afghan government. There are now about 14,000 U.S. forces there, and more trainers and advisers are scheduled to deploy in the coming months. Defense Secretary Jim Mattis earlier this month said this will make it possible for U.S. advisers to serve with more of the Afghan units, strengthening them in the fight against the insurgents. The U.S.-led coalition has also increased targeting of Taliban opium operations, including narcotic processing facilities in Helmand Province in the south. The White House lunch was attended by representatives from the 15-member U.N. Security Council, including ambassadors to the U.S. from China, France, Russia and Britain. The discussions were expected to also focus on international hotspots such as Iran, North Korea and terrorism. Earlier, attendees viewed missile remnants the U.S. says are proof that Iran has been arming rebels in Yemen. The Trump administration has pushed to punish Iran for funneling weapons to Houthi Shiite rebels in Yemen, which Tehran has emphatically denied. The itinerary also included a trip to the U.S. Holocaust Memorial Museum with national security adviser H.R. McMaster. Published: Jan. 29, 2018, 1:18 p.m.